« Welcome to 21st Century Techno Literacies! Skeleton Creek is trail blazing, cutting edge, and ahead of its time! Already a Patrick Carman fan having loved the Land of Elyon series, Bill picked up a copy for me at the Mystery Bookstore in the Westwood Village. What I held in my hands was more than a book… on the plastic slip case cover, which creates the appearance of multiple computer screens, it states… Read the Book… Watch the Videos… Uncover the Mystery…. oh baby, I was in. “Something” indeed! Ryan and Sarah, who have been best friends since they were like 7 years old, are forbidden to have any contact. Harsh! Why? Well, because Ryan almost died. Just after midnight, he and Sarah were investigating the spooky town dredge, Ryan was startled by “something” and took a nasty plunge, lucky to have only shattered his leg. They were pretty much busted and now their parents will not allow ANY communication between the two high school friends. No phone calls, emails, texts, nothing. And their phones and computers are inspected regularly to keep it that way. But Ryan and Sarah knew they had seen something they could not explain at the dredge… After the accident, Sarah discovers she DID catch “something” on her video camera, so taking a major risk, she secretly emails it to Ryan. Though the images on his screen awaken frightening memories of that painful night, both have a burning desire for answers and pick up where they left off in their taboo investigation. Stuck in bed with a huge leg cast, Ryan records everything in his journal while Sarah plans to go back to the haunted dredge… alone. Carman and Scholastic went out on a limb with this ground breaking first multimedia mystery. Skeleton Creek is a TRUE video-book hybrid (vBook), where the story is intertwined by Ryan’s journal (the book) and Sarah’s videos, directed by Jeffrey Townsend. Of course, the parents are unsuccessful in severing all contact since kids these days are tech-savvy enough to cover their electronic tracks. So Ryan and Sarah continue to investigate the mystery of the gold dredge, with discreet emails to each other containing cryptic messages, scans of old documents and of course, videos. While reading Ryan’s private journal, you will learn Sarah’s loaded passwords and log on to her website to watch the videos. Ryan is forced to wait helplessly on the side lines while his best friend repeatedly puts herself in danger… but on top of everything, they’re deeply afraid of being caught! If their parents find out, they would immediately move Ryan and Sarah away from their childhood home of Skeleton Creek, and they would never, ever see each other again. But at long last, Ghost in the Machine landed on the bookstore shelves and the danger continues. More dark clues of an old underground society and uncovering symbols in code lead to deeper investigation, both on the net and in the small town where secrets are both buried and out in plain sight. The two friends began to realize they can’t trust anyone, even the people closest to them, and Ryan begins to even question himself, no longer sure what is real anymore. To make matters worse, the dredge and all its secrets, is scheduled to be destroyed! Drawn into an adventure of ancient alchemy, dredge history, and death, Ryan and Sarah race the clock to assemble all the scattered puzzle pieces before it’s too late. I devoured Ghost in the Machine in record time, thrilled and delighted with Carman’s twisted tale and its “conclusion”. But alas, though the big mysteries are finally revealed, we are left with a troublesome loose end, and Ryan and Sarah may not be “out of the woods” after all! But Carman assures us next up… Skeleton Creek Investigations!! I know I can’t wait! No seriously, I can’t. 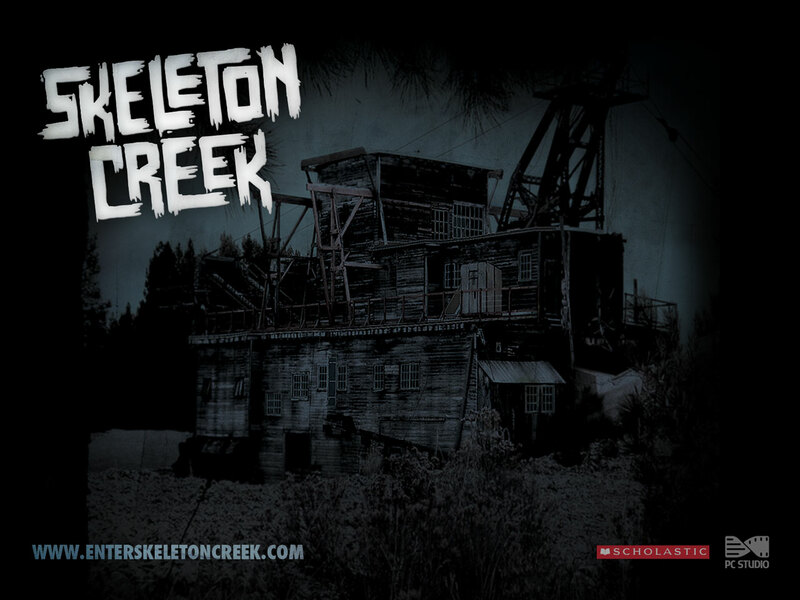 So in the meantime, I log into this awesome Skeleton Creek fan site to chat with other Creekers and find out the latest. Like right now, there is a totally happening art contest. I can’t draw, really, but I can Photoshop a little, so fear my entry! Must win signed copy of Ghost! (Note: as of 11/26/09 this site is under construction & you’ll be re-directed). If you like movies and film making, join the PC Studio Backlot conversation! Watch the extra “making of” Skeleton Creek videos (and more!) in the near multi-media future! And Mr. Carman just posted (see, you so need to log in) that Skeleton Creek has officially been optioned by Intrepid Pictures! Way awesome! Post Scriptum: Mr. Carman just posted this interview! Post Post Scriptum: Join Skeleton Creek on Facebook! Purchase Skeleton Creek and Ghost In The Machine from Amazon! This entry was posted on November 19, 2009 at 6:13 am and is filed under Multimedia YA Review. You can follow any responses to this entry through the RSS 2.0 feed. You can leave a response, or trackback from your own site.